New this year the BVA has updated our Logo. See attached press release. The new Logo which some of you may be able to see under my signature, spells out the Blinded Veterans Association. The new logo includes the impression of three overlaid stars, red white and blue, to the right if the stars, the text Blinded Veterans Association in the same blue as the last star. Under the name is a banner in smaller text, in all caps, which says “ Serving Blinded Veterans Since World War II” this text is centered directly under the stars and BVA text. BVA is proud of our history, our membership, and our mission to serve all blinded veterans. BVA will be implementing this new logo across all of our print and distributed materials. This new logo does not replace our National Seal which remains the circle, star, bayonet and two hands reaching through the clouds clasped in front of the star and Bayonet. The circle logo which we call the National Seal will remain on all official headquarters documents. The new logo featuring the red white and blue stars alongside the name of the organization will be used from now on. This rebranding will allow us to better define ourselves, bringing greater understanding of who we are and the services we provide. BVA is still the only congressionally chartered organization to serve blinded veterans, we hope to increase our outreach and our membership, connecting new blinded veterans to our current members. We hope that you will join us in sharing the new BVA logo by purchasing a Polo shirt with an embroidered BVA logo on it. The collared polo pictured is a heather gray with three buttons. The shirts available at convention will be a more solid color of cool gray. The new BVA logo is embroidered in color on the right chest area. It is about 4 inches in size. Polo’s are available in adult, small, medium, large, XL, and 2XL for $25. Shirt Sizes 3XL and above are available for an additional $5-$8 more. We want to see you representing BVA everywhere you go, so when you purchase two polo shirts you will receive a BVA canvas briefcase FREE!! The canvas bag is black and tan and features an embroidered BVA National Seal on one side. It has one large zippered pocked, with a smaller zippered pocket and space for pens on one side, it also has a shoulder strap as well as handles. BVA also has additional items for sale to freshen up your wardrobe. A Black BVA baseball cap with the National Seal on the cap and the text Blinded Veterans Association framing one edge of the bill. The cap also has an adjustable Velcro strap with B.V.A. embroidered on it. Each hat is only $20. The canvas briefcases are also for sale individually at a price of $10, and we have 1 BVA tie left, first come first serve at a price of $25. No later than MONDAY JULY 20th. PLEASE INCLUDE YOUR NAME, PHONE NUMBER, and most importantly your ORDER. All items that are purchased will be ready for you to wear at the 2015 BVA Convention. You will pick up your order and pay for it at registration when you arrive. Payment is preferred in cash or check at the time of pickup. We will only make as many items as are requested so don’t miss out on this opportunity. BVA POLOS: $25-$43 depending on size. Purchase 2 polo’s get a canvas briefcase FREE! Veterans throughout the United States are being warned of businesses charging fees to obtain copies of free military service and discharge records. Veterans and family members are reminded that discharge paperwork, including DD-214s and other forms, is available free of charge through many county veterans service offices and accredited veterans service organizations. Veterans are warned to be wary of certain websites, which charge $90 to $150 to obtain copies of DD-214s and other free military records through their "expedited service." The Department of Veterans Affairs (VA) today urged Congress to act expeditiously and approve its pending request for fiscal year 2015 budget flexibility. The request, formally transmitted on June 23, seeks the transfer of funds from the Choice Program to continue VA's efforts to increase Veterans' access to care and life-saving pharmaceuticals. “It is essential that Congress pass legislation to provide the requested budget flexibility by the end of July 2015,” Deputy Secretary Sloan Gibson wrote. “This is necessary to replenish critical operations funding that VA had to reallocate from other medical services programs to sustain Care in the Community, after those funds were depleted. If these program funds are not restored, VA will face shutting down hospital operations during August 2015. Nationally, VA completed more than 56.2 million appointments between June 1, 2014, and May 31, 2015 – 2.6 million more appointments than were completed during the same time period in 2013-2014. VA also made more than three million authorizations for outside care. DOVER AIR FORCE BASE – For the better part of 14 years of war, the transfer cases and bodies never seemed to stop arriving at Dover Air Force Base. "We used to look at the casualty board and hope for a break," said James Parsons, an embalming technician with Air Force Mortuary Affairs Operations, the only U.S.-based funeral home dedicated to the nation's fallen military. "Now? Now it's good." In 2007, the worst year of the fighting in Iraq and Afghanistan, some 1,020 military casualties were shipped home, according to Air Force Col. Dan Merry, AFMAO's commander. Last year, the overall total fell to 60. "And it has gone down gradually since," said William Zwicharowski, Port Mortuary branch chief, who was with AFMAO, and the agencies that preceded it, for the entirety of the conflicts. So trimming, and training, are now the watchwords at AFMAO. 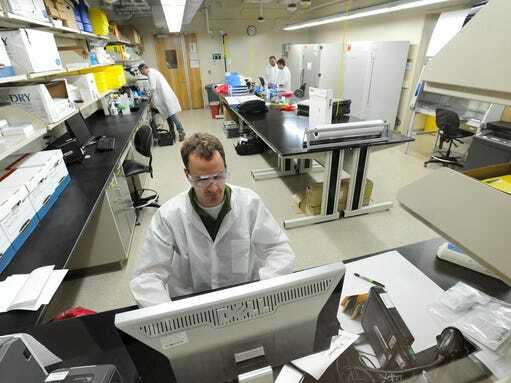 Its next-door neighbor at Dover, the Armed Forces Medical Examiner System, has also shifted gears, from performing autopsies on every returned casualty from Iraq and Afghanistan to studying lessons learned, taking on more emerging historical DNA identification work and helping non-defense agencies with medical legal death investigations. "We're staying busy," said Army Col. Ladd Tremaine, director of AFMES, noting the group's increasingly worldwide responsibilities for the federal government. "Most of our work is not done back in that autopsy suite. Most of my examiners are on the road." It's been a remarkable shift. 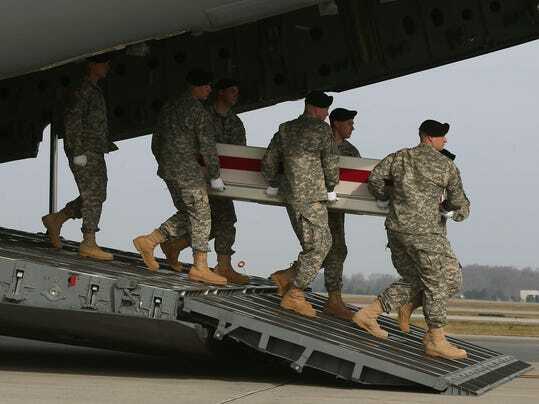 A total of 6,852 U.S. military personnel have died overseas since 9/11. All were carried off a cargo jet ramp, one by one, and into the complex that houses the two agencies. Even as stunned family members were welcomed, comforted, even counseled, the remains were being scanned (for explosive material), catalogued, autopsied, embalmed and prepared for burial. Now, the number of dignified transfers from overseas has slowed to a crawl. "We are not used to it," said Zwicharowski, a former Marine. "We've almost slammed the brakes on now. Which is great. ... It's probably the best problem I've ever had in my life, [which] is to not have 10, 20, 30 bodies to process a day. So it's a good problem to have." The slowdown is giving AFMAO time to take stock of itself. 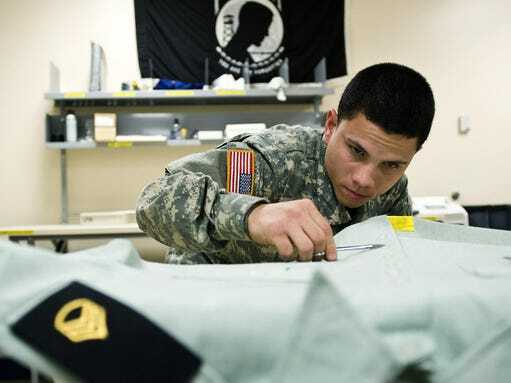 Recently borrowed mortuary personnel are being returned to other bases - as well as to Dover's Air Force Reserve unit, the 512th Airlift Wing, which it has relied on heavily during the wars. AFMAO could get even smaller, Merry said. AFMAO has 50 personnel assigned, but that could be halved "if we stay this way for a year or two," Merry said – adding that this could quickly change if the U.S. keeps increasing its small combat presence in theater. 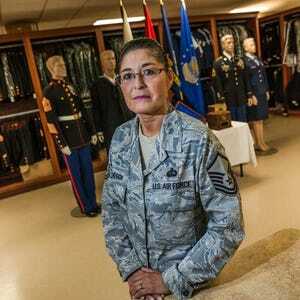 "If we get 30 or 40 thousand boots on ground, in harm's way, we'd start plussing back up," Merry said. To prepare for the unexpected – a mass casualty event, e.g. – Merry is implementing a more efficient rapid "recall" system. "We're looking at a system where we can hit a button and get everybody we need back here, fully trained, fully checked out, ready to go," he said. "It's not a matter of if," Zwicharowski said. "It's a matter of when, unfortunately." That was the case when 11 Louisiana National Guardsmen were killed in a March helicopter crash during training in Florida. All the troops were brought to Dover; AFMAO reached out to the Navy to borrow licensed embalmers to help out, Merry said. With fewer permanent personnel on staff, Zwicharowski said, "We're turning to training on mannequins, restorative art training, embalming training, and licensing." Training is particularly important for specialists who sometimes handle bodies in far worse shape than those that typically arrive at a mortuary. Roadside bombs were the No. 1 killer in these wars. Tremaine's AFMES is responsible not only for worldwide U.S. military autopsies but medical legal death investigations for the entire federal government across the globe – agencies such as the FBI and NASA – which is why his examiners often find themselves traveling. "The sheer numbers have decreased," Tremaine said. "The complexity of our cases has increased. Department of Justice has been using us extensively over the past year." He pointed to the police shooting death of Michael Brown in Ferguson, Missouri, which was investigated by the FBI. "When something like Ferguson occurs, you're going to have the locals investigate it, and … the same thing happened here in Baltimore recently – you're going to have the family request a second autopsy," Tremaine said. "Who's going to be the ultimate arbitrator or make sure that everybody's playing on an even field? Who's the honest broker? Well, we've essentially become that honest broker. We come in as a federal entity; we get to see all the evidence and information; and potentially do a tertiary post-mortem examination, independently. And then we present that to the Department of Justice." In addition to its autopsy work, AFMES recorded in detail war injuries with an eye toward improving combat trauma care. Tremaine wants to make that database more easily accessible. "All throughout the war, we've been very active in identifying the glaringly obvious, and getting that information out quick," he said. "Now it's time to sit back and look at all the information in its totality, and discover those non-glaring issues that will only be captured through more in-depth research. Can we discover something else that can potentially change techniques, tactics and procedures in the future?" 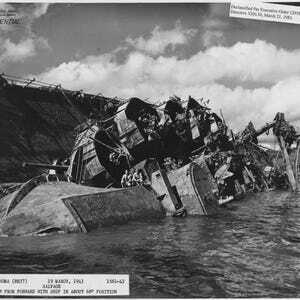 AFMES' DNA Lab will also stay busy performing DNA analyses on remains from past conflicts, such as those of the sailors and Marines who died at Pearl Harbor aboard the USS Oklahoma who were buried, unidentified, in mass graves in Hawaii and are now being exhumed.